He's every woman's dream and one woman's nightmare. 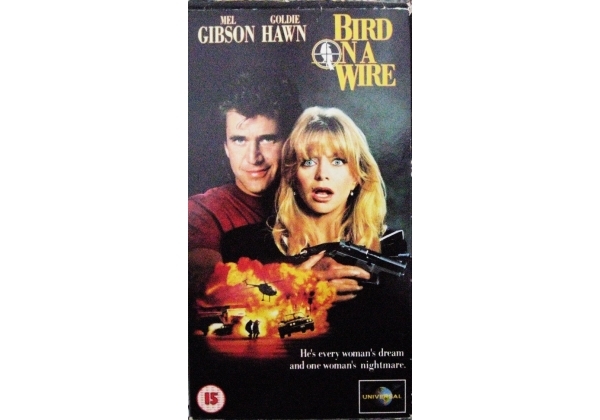 Superstars Mel Gibson and Goldie Hawn team up in this non-stop action-comedy directed by John Badham. Hiding under the FBI witness-relocation program Rick Jarmin (Gibson) gets nervous when old flame Marianne Graves (Hawn) recognizes him. But before he can assume a new identity, the man he put in jail (David Carradine) is released and comes to pay his respects. Rick and Marianne find themselves thrown together on an exhilarating cross-country scramble, barely evading the gangsters, police and an amorous veterinarian (Joan Severance). Their whirlwind travels eventually lead to an unforgettable climax in an elaborate zoo exhibit. PBS-TV calls the film " a roller coaster of a movie with hot action and wild humour! This Bird soars!" © Universal City Studios and Interscope, Inc.
Or find "Bird on a Wire" on VHS and DVD / BluRay at Amazon.